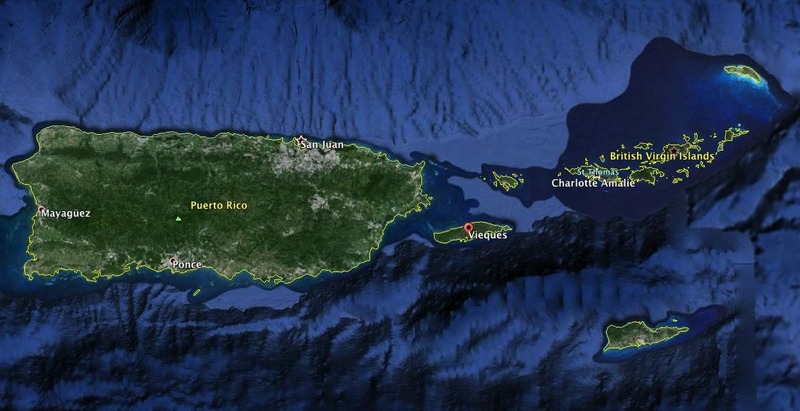 From San Juan International Airport (SJU), Cape Air and Vieques Airlink provides direct flights to Vieques Airport. Flight duration is approximately 25 minutes. Note also that Cape Air has a special arrangement with Jet Blue for easier connections at SJU. Air Flamenco and Vieques Airlink also provide flights to Vieques from Ceiba Airport, which is located on the East Coast near the town of Fajardo. Villa Chavaniac is located a short 15 minute drive from Vieques airport. If you wish to combine your visit to Vieques with a visit to St Croix, Cape Air provides direct flights to the island of St Croix from Vieques. Please contact Ginette Montes at bwconcierge@outlook.com or telephone +1 (787) 523-1660. Make sure you mention you are booking with Villa Chavaniac. Vieques can also be reached by ferry from the Ceiba Ferry Terminal. You will need to travel from San Juan International Airport (SJU) to Ceiba either by rental car or taxi. The cost of a taxi from SJU is approximately $80 for up to five persons. For more information on taxi services to Ceiba please contact the Santana Taxi Service. Travelling to Ceiba via rental car is not recommended While the ferry has the capacity to carry vehicles, car rental companies on the Island of Puerto Rico will not permit you to take their rental cars to Vieques. For our guests that want to explore the island and its vicinity, we recommend Wai-Vie Adventure Tours & Rental and Colon Horseback Riding. Both businesses are owned and operated by young, local Viequense entrepreneurs. Your patronage directly supports economic development in Vieques. For priority booking, indicate you are staying at Villa Chavaniac. More detailed information on their tours is offered below for your convenience. Learn about the underwater world from our knowledgeable guides on this colorful exploration of coastal reefs and ecosystems. Relax as we take care of the gear, transportation and guidance. It's your choice of destination in this excursion that can accommodate beginner to advanced snorkelers. Suitable for ages 6+. Minimum of 2 persons for shore snorkel tours to go out. Exertion range: Easy, Moderate, Strenuous. $65 per person. Exercise your mind and body through our paddleboard tour that covers the importance of coastal ecosystems and the native plants and animals that we find there. Suitable for ages 6+, all levels welcome. Minimum of 2 persons for the tour to go out. Exertion range: Moderate, Hard. $65 per person. Explore Vieques's bays and canals and drift along in serene balance with nature to experience the surprises that a kayak tour reveals. Suitable for ages 6+, all levels welcome. Minimum of 2 persons for the tour to go out. Exertion range: Moderate, Hard. $65 per person. Truly experience the diversity of Vieques island by combining a paddleboard or kayak tour with a shore snorkel tour and save on the price of both! Suitable for ages 6+, all levels welcome. Minimum 2 persons for combo tours to go out. Exertion Levels: Easy, Moderate, Hard. $85 per person. Our la Promesa or the Promise is a 25' Dinghy Caribe, with (2) 115 horsepower motors, provides a quick, comfortable ride with minimum spray, so that you spend more time at our guided snorkel spots. Choose from locations around Vieques or Culebra's shores and experience island coastlines that are inaccessible by car. After snorkeling, rest and soak in the sun on the fore and aft cushions, enjoy light refreshments or chat with your knowledgeable guide about the marine life you see on the reefs. Minimum 4 persons for charters to go out. Exertion levels: Easy, Moderate3 hr charters around Vieques $105 per person ½ day and full day charters to Culebra starting at $125 per person. Fish the seas on our la Promesa, (the Promise) a 25' Dinghy Caribe with (2) 115 horsepower motors designed for quick transportation with minimum spray so that you spend more time fishing! Use our gear and follow our instruction to have a sporting venture reeling in Dorado, Bonito, Yellowtail, just a few of the many marine species to be found. Suitable for ages 10+. Light refreshments are provided, but the Promesa has a built in cooler for your additional drinks and food. 4.5 hours. $165 per person. What's Included? All tours include use of gear, guided instruction, bottled water, a light snack and complementary transportation from Isabel II. We can assist with adding catered lunches provided by Chef Vicente. We specialize in small groups of no more than 6 persons per guide. How much time should I schedule for my excursion?Allow approximately 3 hrs from departure to return unless otherwise noted in the tour description. All activities excepting tours to Culebra have choice of 8:30am or 1pm start times. What to wear and bring? We recommend wearing your bathing suit and bring towels and sun protective clothing such as sunglasses, hat and rash guard. If you will use sunblock, we encourage you to select a brand that keeps our reefs safe from harmful chemicals. This Travel & Leisure article provides information and suggestions on reef safe sunblock options. To safeguard your items from accidentally getting wet, we highly recommend leaving your valuables at your lodgings or carrying them within a dry bag. Wai-Vie charge 100% of the tour price for no-shows or day of cancellations. For parties of less than 5 people, cancel no later than 24hours prior to the start time of your activity to receive a full refund of your reservation. For parties of 5+ persons, cancel no later than 48hours prior to the start time of your activity to receive a 50% refund of your reservation. For parties 5+, cancel with one week's notice to receive a full refund of your reservation. We reserve the right to charge a re-booking fee of $20 per ticket for schedule changes made past the cancellation periods described above. Click on images to view larger image.Please. Click on this LINK to take you directly to our Google Maps location. Maritza’s Car Rental (Email: maritzascarrental@gmail.com. Tel: (787) 741-0078 or (787) 741-1666).